Uglyworld #555 - Cookie Time!!! (145-365), originally uploaded by www.bazpics.com. Wage and Babo had been trying to find their one of their long lost cousins for nearly 6 months now, he was always being referred to as American Ice-Bat. As well as working long hours every day I've been doing everything I could to track their missing cousin down, even as far as trying to contact Wedgie's hero Jack Bauer, but unfortunately he was too busy trying to save the world from threats as always. Thankfully Jack put us on to some of his covert ops contacts who were fully aprised of the situation and low and behold tonight Ice-Bat arrived at my hotel, hungry for food but alive and well. 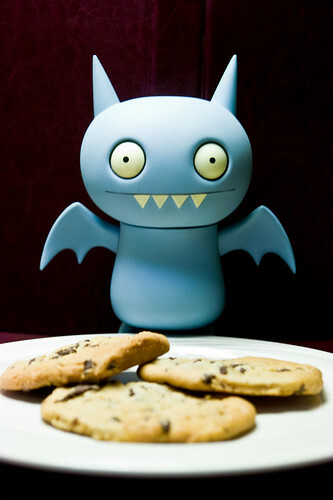 Babo immediately called home to Wage in Aachen, and between them they devised an awesome plan to make their cousin feel like part of the family - COOKIE TIME!!! He's already munched his way through about 20 cookies and shows no signs of slowing down, I'm going to have to be quick to get one of the final 3 before he scoffs them too!